You may have heard the buzz by now about a young startup that’s being fueled by some pretty impressive star power, including the likes of the one and only Lady Gaga. The project, called Backplane, was co-founded by Lady Gaga’s manager, Troy Carter, and raised an early (then hush hush) seed round from an impressive set of investors, including Google Ventures, Founders Fund Angel, Menlo Ventures, SV Angel, i/o Ventures, and Tomorrow Ventures. The startup is also being led by a group of former Facebook and Google employees, as well as other tech-heavy companies, including co-founders Joey Primiani, an ex-Googler and creator of Cortex, Alex Moore, former Director of Operations (and the first employee) at Palantir Technologies, along with Panantir cofounder, Joe Lonsdale, who has become the Chairman of Backplane’s Board of Directors. The startup is using its star power and tech cache to, among other things, hold a music hackathon at SXSW — which will be judged by music industry veterans, like Scooter Braun, the guy who helped bring you The Bieber — in an effort to continue attracting top-flight engineers to its platform. There’s a lot of tech development and strategy being applied to the platform to support the startup’s founding value proposition, which is, simply put, to change the way traditional intermediaries connect fans with artists. In other words, it’s a community platform that combines features from Pinterest, Tumblr, Canvas, and Ning to bring together the most effective parts of social and visual design in the name of seriously upping the engagement level on community-centered platforms. Backplane started with LittleMonsters.com, the first portal to be powered by Backplane, and the new online community for Lady Gaga and her army of fans. Of course, that’s just the beginning, the startup wants to create a bullpen of community sites not only for brands and celebrities, but for virtually any interest group. But what does “community” mean in the Backplane context? In the case of LittleMonsters, Backplane provides site-wide “like” icons, social commenting, photo capturing and editing, along with integration with Google Calendar and Gmail, and more. But the real key to Backplane’s community play, says Head of Marketing Sarah Ross (and early TechCruncher), is an i/o Ventures incubated sharing platform and browser extension called Cortex. Cortex was developed by developers, Eric Wolf and Joey Primiani, to be a simple way to integrate social functionality into how we surf the Web. As MG wrote at the time, instead of reworking the UI elements of Chrome, for example, Cortex adds a sharing overlay to any site. All you do is click you mouse and hold it down. Up pops a prompt to share to Facebook, Twitter, Tumblr, and more. It automatically finds the right image and title, allows you to add a message, and blast it out over social networks. The key is simplicity and speed. When Primiani hooked up with future Backplane co-founders Moore and now CEO Matt Michelsen, they were blown away by the technology and immediately set about acquiring it. Backplane officially announced the completion of its Cortex acquisition today, as well as the fact that the technology is powering all social syndication across Backplane. Not only that, but on top of the $1.8 million the startup raised in seed funding (mentioned previously), Backplane has today closed a series A round of financing that adds to its already impressive array of Silicon Valley investors, including Sequoia Capital, Greylock Discovery Fund, Battery Ventures, Formation 8, and Advanced Publications Inc. While the startup is not sharing exact numbers, we have confirmed that the round is between $4 and $5 million, as the Wall Street Journal initially reported. That brings the startup’s total funding to over $6 million in just over a year. The round came in a convertible note to give the startup more flexibility when raising its series B, as the WSJ reported. The LittleMonsters community is in controlled public beta, and by controlled, we mean that there were hundreds of thousands of signups for early testing. 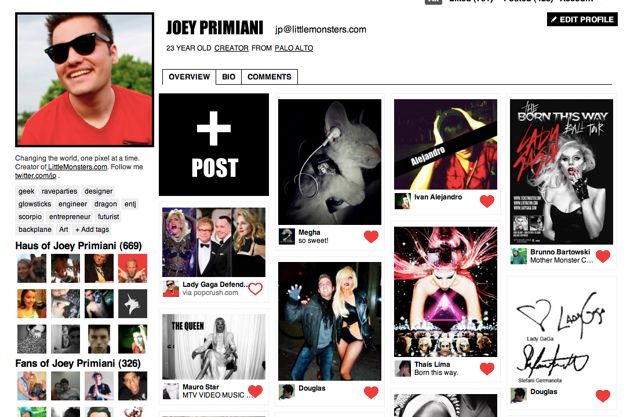 TechCrunch got an early look at Gaga’s Backplane community, which you can check out here. Among other things, the community offers some nifty chat features, as users can instant message each other in any language and have it translated in realtime into the recipient’s language of choice. The CEO told us that about half of the site’s early testers hail from Brazil, with interest from China, and others. No doubt this will help make Backplane sites into international hubs of conversation about Lady Gaga, and soon many more groups and brands. In these bits of tech genius alone, one starts to see why there’s been so much early interest from Silicon Valley executives. Though it certainly doesn’t hurt to have the backing of Gaga Nation. LittleMonsters.com is slated to go live this spring, with further communities going live over the course of the year. For more, check out Backplane at home here.